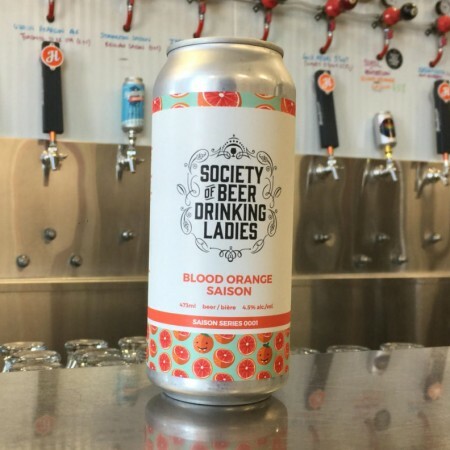 TORONTO, ON – Henderson Brewing and the Society of Beer Drinking Ladies (SOBDL) have announced that their recently released collaborative beer will soon be available at the LCBO. Brew0001 was created using Oregon Fruit Products’ Blood Orange concentrate and boasts the New World Saison yeast strain from Ontario’s Escarpment Labs. It’s highly carbonated, dry and spritzy with a deep gold hue and aromas of bitter orange and peach fuzz. The result is hazy and refreshing, with up-front juicy citrus notes, and a medium hop bitterness and tart finish. Brew0001 is currently available in the Henderson taproom and retail shop, and 473 ml cans will be on the shelves soon at LCBO locations throughout Ontario. A launch party for the LCBO release will take place at Henderson on Friday May 3rd, and will feature a tap takeover of beers from female brewers and female-owned breweries, a mini artisans market and SOBDL merchandise table, and food by Phancy Food & Catering. For more details, see the Facebook event listing. The next Henderson/SOBDL collaboration – Brew0002, style still to be announced – will follow in the autumn.